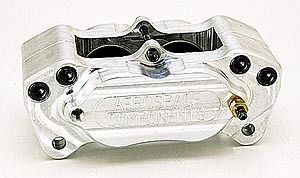 Aerospace Components high performance brake calipers are CNC machined from 6061-T6 billet aluminum and are engineered to be compact and to provide optimum clearance. All fluid passages are internal, eliminating external lines and the need to have a different left and right caliper. The bleed screws are standard 1/8''-27 NPT. Made in the U.S.A.
JEGS 28007 - Ceramic Disc Brake Grease 6.75 oz.